"We did expect to see net energy decrease, but we had no idea of the magnitude." There’s no doubting the transformative power of technology. Advances in tech have led to new and improved entertainment experiences, from allowing us to stream our favorite shows on-demand to immersing us in virtual worlds. They’re changing how we earn a living by making it easier to work remotely, and now, instead of going out to buy stuff, we shop online. Americans are staying home more, and according to a new study, that lifestyle change is affecting energy consumption. For the study, which was published in the journal Joule, researchers from the University of Texas at Austin and the Rochester Institute of Technology analyzed 2003 to 2012 data from the American Time Use Survey (ATUS), a U.S. Bureau of Labor Statistics survey that compiles information on the daily schedules of some 11,000 Americans. The researchers found that Americans are staying home an average of eight days more in 2012 than in 2003. Conversely, by spending more time at home, Americans spent less time traveling (1.2 days) and staying in non-residential buildings or areas (6.7 days) in 2012 compared to 2003. The age of the survey respondents affected the time they spent at home, according to the researchers’ analysis. 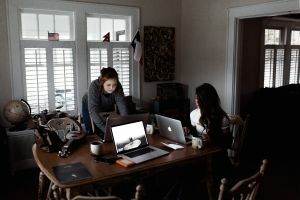 People between the ages of 18 and 24 spent an average of two weeks more at home in 2012 compared to 2002, a change that was 70 percent higher than the rest of the population. As for what they were doing at home, most people spent their time working, watching videos, and using computers. At the same time, people also spent more time doing the “essentials,” such as sleeping, preparing meals, and eating. The researchers didn’t simply focus on the fact that Americans are staying home more, though — they also looked at how that lifestyle change affected energy consumption. What they found surprised them: staying at home decreased the average national demand for energy by an estimated 1,700 trillion BTU in 2012. That’s equivalent to about 1.8 percent the total national energy demand for the year. “We did expect to see net energy decrease, but we had no idea of the magnitude,” said lead researcher Ashok Sekar from the University of Texas at Austin in a news release. Image Credit: Sekar et al., Joule (2018). Let’s put that 1.8 percent or 1,700 trillion BTU into perspective. As Sekar told Futurism, that amount of energy is approximately equivalent to the state of Kentucky’s total energy consumption in 2015. It’s most than what Connecticut, Hawaii, and Nevada combined consumed that same year, and it’s nearly half the total energy consumed by the state of New York in 2015. This change in lifestyle could have a noticeable environmental impact. If Americans are staying home more often, that means they are consuming less fuel for transportation, which remains one of the biggest contributors of greenhouse gasses. In 2015, around 27 percent of carbon emissions in the U.S. came from transportation, according to the Environmental Protection Agency (EPA). Presumably, that number could’ve been higher had technology not made it possible for Americans to work or shop remotely. The team did note that their study doesn’t account for variances in location, labor markets, or demographics that could impact activities and, therefore, emissions. 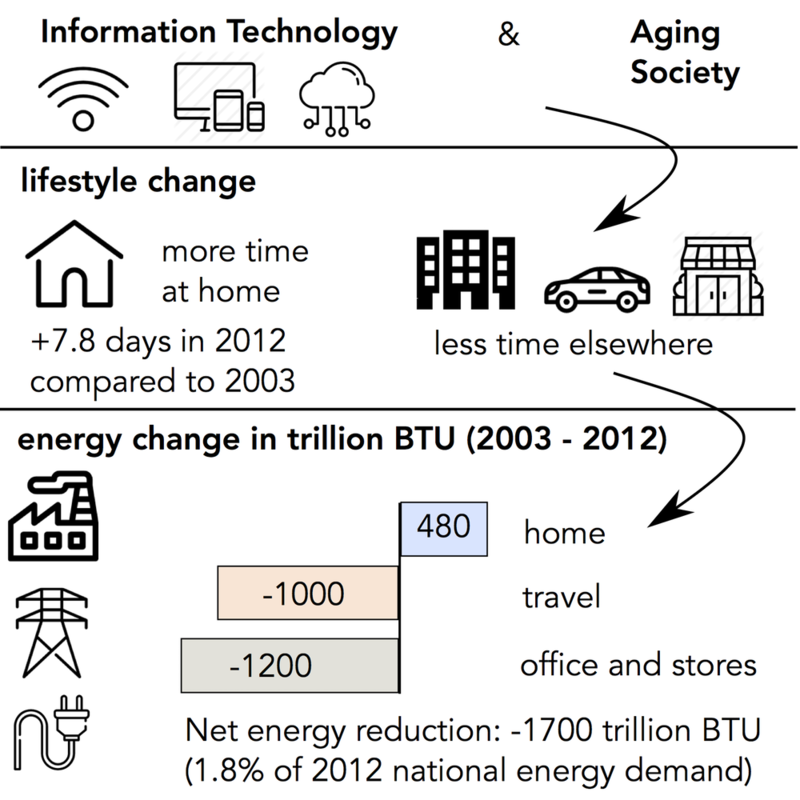 The team’s study makes one thing clear, though: technology does influence lifestyle and that influence is currently decreasing energy consumption. If the shift in habits and lifestyle continues on its current trajectory, it could play a significant role in the fight against climate change, right alongside decreased fossil fuel consumption and increased usage of clean energy alternatives.